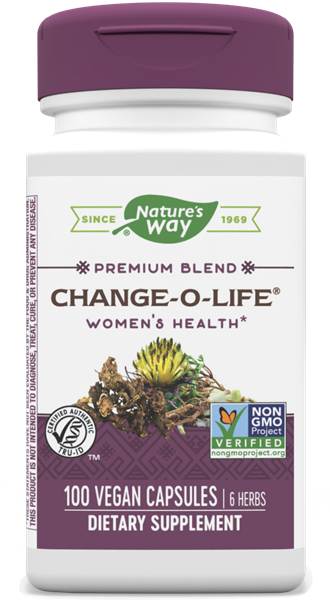 Change-O-Life / 100 Caps - Nature's Way®. Do not use this product if pregnant or nursing, if you have high blood pressure, cardiovascular disease, have a blood clotting disorder, or are taking blood thinning medication. Discontinue use and consult a healthcare professional if you have a liver disorder, or develop symptoms of liver trouble such as abdominal pain, dark urine, or jaundice. Persons with allergies to plants of the Asteraceae (Compositae) family, including ragweed, should use this product with caution. If you are taking any medications consult a healthcare professional before use.